So, the Superbowl is in Dallas this weekend. Several of my friends had off work yesterday/today for a snow day. I however, did not. Because a) I work from home (can’t stop me mr. evil winter weather muahaha) b) my company is based out of sunny California c) it was entirely too cold outside to really leave the computer anyway d) I heart my job so I end up working on “days off” – some people call those weekends. Also, my birthday is in 5 days. Which is awesome… but… WHERE THE HECK DID JANUARY GO?! Seriously, I blinked and 2010 was gone and then someone stole January. I will be celebrating this weekend with a fun Saturday night of sushi with whoever loves me enough to brave the cold. 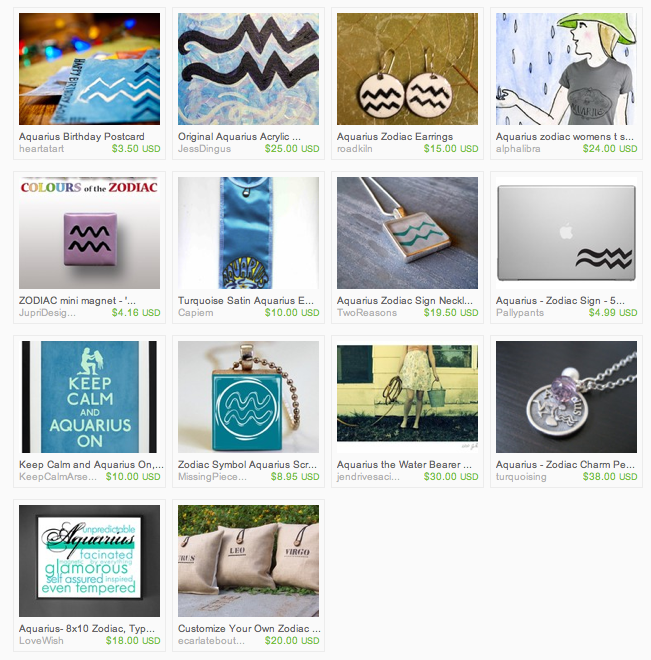 In a I-heart-etsy-forever-fangirl moment I created an Etsy Collection of Aquarius stuff/gifts/paintings/crafts/jewelry. I think it’s fun my mom, myself, and 2 of my best friends are Aquarians. So if you happen to know a person or two with birthdays in the next few weeks here are some gift ideas for you. Speaking of Etsy – do you have any Etsy stores I should stalk? I’m wanting to support the 20something/20sb crowd particularly. Elisa, Ophelia’s Webb, is doing an awesome series on Love for February. I’m still kicking myself for not making time to jump in, but I’m expecting greatness. my friend Jared is a wedding photographer here in Dallas area. He just ran a contest to give away a free photo shoot to the couple with the best engagement story. I can say, I read the winning story and it’s straight out of Disney. Doniree hosted a very fun series of guest bloggers for January on “what’s it your year to do/be/have”. I wrote that 2011 is my year to Belong. You can see the full series on Doniree.com (which I’m sure you are already subscribed to). Yesterday was Monday. Did you groan at your alarm clock because you were going to a job you hate? Perhaps you should take some inspiration from the gutsy Sydney Owen who decided to quit the practical life and go “balls out” (her words) into her dream life. Ever met someone who is so ambitious that you automatically feel like a slacker for knowing them? Well then you must know Jenny Blake. While most people embrace mid-twenties head on with a quarter-life crisis, Jenny wrote a book. Yes a REAL BOOK. Like it’s on amazon and everything. Life After College: The Complete Guide to Getting What You Want . Pre-order it now. Speaking of Jenny and ambitious people – if you are new to the blogging world or just want to know more about blogging you can get 1 free hour with Rockstar Bloggers. Hey and guess what I’m one of the blogging people. I always wanted to be a rockstar. last but not least – I’m working on an ever growing list of things people (YOU) want to accomplish before age 30. Because, well I’m TURNING 29 IN FIVE DAYS! So add your goals/ambitions/dreams to the 20sb convo (link above) or on the Brazen Careerist discussion or in the comments below. To recap: do know any 20something Etsy store owners? What do you want to accomplish by age 30? Go read all those links. Talk about busy and ambitious – look at YOU! I work on those “weekends” too because I like that I do – kudos to you (and me :)) for finding and creating that. Next year my dear! Reading through the entries for this year’s series, yes, greatness is an inevitability! I didn’t get a chance to comment over the weekend — just wanted to say thank you so much for the wonderful shout-out — you are amazing! I’m with Doni – YOU are a total rockstar! Thanks for inspiring all of us to be awesome! !